There are just things the old media just won’t tell you, now that class warfare is Obama’s campaign slogan for 2012. Things like what Obama’s no drill policy is doing to our oil supply, what the fed is doing to devalue our dollar, yes oil is traded in dollars, and other pertinent data that fuels the Obama demagoguery. Let me start by putting our earnings into context for U.S. motorists. 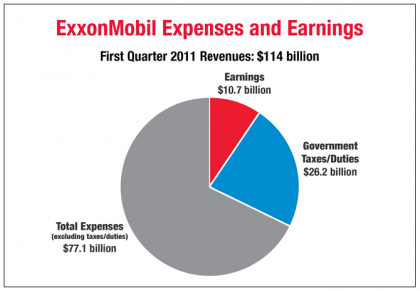 ExxonMobil’s earnings are from operations in more than 100 countries around the world. During the first quarter, more than three-quarters of our operating earnings came from outside of the United States. The part of ExxonMobil’s business that refines and sells gasoline, diesel and other products in the United States represents less than 6 percent – or 6 cents on the dollar – of our earnings. Why so little? Because we actually buy more crude oil to refine into gasoline and diesel in the U.S. than we produce ourselves. And these purchases are made on the open market at the prevailing rates. During the first three months of this year, for every gallon of gasoline and other products we refined and sold in the United States, we earned about 7 cents. Compare that to the 40 to 60 cents per gallon that went from gasoline consumers to the government (state and federal) in gasoline taxes. The underlying question people are asking is: Why are oil prices so high at the present time? The answer to this question is important because the price of crude oil accounts for most of the price of gasoline. There are several factors involved in the rise in oil prices. First, as a result of the global economy strengthening – particularly in countries like China, India and Brazil – demand for crude oil is on the rise. Second, political instability in some oil-producing regions is contributing to uncertainty about future oil supplies. Oil markets are well-supplied today, but the issue is this: What will it cost to replace this supply if it is lost in the future? This uncertainty about tomorrow is reflected in prices today. Finally, another factor behind higher oil prices is unique to the United States. And that’s the weak U.S. dollar. Oil and most other food and industrial commodities are invoiced in dollars. Accordingly, when the dollar goes “down” the price of primary commodities tend to go “up,” and vice versa. The dollar is at a three-year low against other currencies and is approaching the record low which occurred in 2008, when oil prices were at historically high levels. The dollar’s decline accelerated last week after a warning by Standard & Poor’s about the country’s $14.3 trillion debt and economic weakness compared to other countries. So these factors all combine to drive oil prices up. What is our government doing about it? Unfortunately, they’re reaching for the political playbook rather than seeking real solutions. Among some of the many things the Obama regime is doing to limit our oil supply … Shell Cancels Arctic Oil Drilling Plans for 2011 … After having spent $4 billion so far to explore the tract. Why you ask, when they have a 27 billion barrel find about 50 miles from the Alaska pipeline terminus — Simple the ice breaker they planned to use emits CO2, and we can’t deny the global warming hoaxers at the EPA, now can we. Massad Ayoob: A Warning — Got militia? Massad Ayoob is very likely the top of the list of Law Enforcement trainers in the USA. Communist Party USA labor journalist John Wojcik is predicting huge labor union/immigrant rallies across America on May 1. The US left wants to legalize millions of illegal immigrants, because they know that the vast majority will vote Democrat. In these times of high unemployment, resentment among many unionized and unionized workers and the unemployed against illegal immigrants is high. Therefore the left is deliberately trying to bring all these groups into an alliance behind Barack Obama and the Democrats and against the G.O.P. Hundreds of thousands across the nation marching and rallying this May Day will be fusing two of the great struggles of the day – the fight for workers’ rights and the fight for immigrant rights. The labor movement, rejecting the notion that immigrants are taking jobs away from the native-born, has jumped with both feet into the fightfor immigrant rights. This is funny, because the only rights illegal immigrants have, is to go back home. Earlier this week Obama met in the with illegal immigrant celebrity activists to coordinate these Communist May Day rallies. Hey is this our illegal president meeting with illegal immigrant supporters? The President must be a natural born citizen of the United States, at least 35 years old and a resident of the United States for at least 14 years. An obsolete part of this clause provides that instead of being a natural born citizen, a person may be a citizen at the time of the adoption of the Constitution. The only operative part currently is … “must be a natural born citizen of the United States, at least 35 years old”, the rest pertains to the original founding. The reason for this last clause was to extend eligibility to Citizens of the United States at the time of the adoption of the Constitution, regardless of their place of birth, who were born under the allegiance of a foreign sovereign before the founding of the United States. Without this clause, no one would have been eligible to be president until thirty-five years after the founding of the United States. Looking at the phrase “natural born citizen” it means born to parents who are both US citizens at time of birth, and born in the USA. I still can’t find anyone who will delineate how an American citizen mother and a Kenyan citizen father makes you a natural born citizen. Because this would mean any third world anchor baby could be president. Is this what we now have, the anchor baby president? So until someone can prove Obama’s father was a US citizen on Barack Huessien Obama’s birth day, then I guess we have a pure media concoction, brought on by the “hide the birth certificate” media scam. Or is it the great msm racist con-game, to totally destroy the Constitution? Because if you take this to the extreme, you get anybody in the world can be president, as long as they were born in the US, regardless parentage, and allegiance. I doubt this is what the founders meant by “natural born citizen” … i.e. born of two parents who were American citizens at time of birth, and born in the USA. This provides the case with no allegiance to America, which is what strangely we have with the current anti-American president. Ann Coulter nails the birth certificate issue again, as she has every time I’ve heard her opine. The reason the issue had traction with otherwise sensible Americans is precisely because Obama’s loyalties seem so “foreign.” His agenda has always been global and he clearly rejects American exceptionalism. Who wants to try, I am all ears. They simply played a better game of chess. And due to this sick game, Obama now sets a precedent that anyone who hates this country, from Osama Bin Laden to Kim Jong Il, can have a child with an American woman and that child can be President. Obama’s defeat of the dual nationality issue, in both the courts and the media, means that the President’s parents do not have to be US citizens. If that is true, then the natural born citizen requirement in Article 2 Section 1 of the Constitution is basically rendered meaningless. If a person born with dual allegiance can be President, then I don’t see the difference between a citizen and a natural born citizen. To become naturalized as a US citizen, one must at least swear an oath of allegiance to the US by renouncing all other allegiances. But a person such as Obama, who was born with dual allegiance is apparently not even required to renounce all previous allegiances under oath. The BC was a conspiracy theory. The dual nationality issue is a legal question. Obama always controlled the issue of whether or not he would produce the BC. But the legal issue was never under his control. So he exercised as much control over it as possible by allowing the birth certificate to fester casting a huge shadow over his dual allegiance. Roaring right along as the president focuses like a laser on jobs and the economy by taping the Oprah show and attending 3 fundraisers yesterday. Doesn’t this guy have a real job? You are currently browsing the Tarpon's Swamp blog archives for April, 2011.